Bring something new to your garden, save your valuable time with FLORIA lawn thatch optimizer – special organic fertiliser. Have you had enough of black patches on your lawn after using a standard fertiliser and scarifying? Bring something new to your garden, save your valuable time with FLORIA lawn thatch optimizer – special organic fertiliser. It is harmless to wildlife, pets and plant borders. Thatch is a natural product of your turf but too thick a layer reduces the quality of the turf. 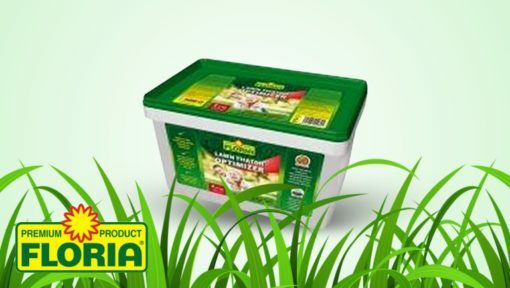 Lawn thatch optimizer is a special lawn fertiliser containing all essential nutrients (nitrogen, phosphorus, potassium) made from purely natural raw materials. The product is enriched by bacteria living in the soil, which accelerate the grass thatch decomposition process. Mycorrhizal fungi in lawn fertilisers serve as a natural helper. They enhance the surface area of the roots, thereby increasing a plant’s uptake of nutrients and water. Thus lawns become stronger and more durable. The nutrients in the fertiliser are continuously transformed by microorganisms into forms that are readily absorbed by plants. The microorganisms decompose the starting substances slowly, owing to which they thereby obtain a natural long-term effect after 2 months. Grass that is left on the lawn after mowing suffocates the lawn, causes its decay and oppresses natural tillering. This Lawn thatch optimizer contains microorganisms that decompose the grass clippings (food for soil microorganisms) and converts them into valuable humus. Use the Lawn thatch optimizer whenever surface mulching or using robotic mowers, or even where you do not perform regular scarification. Begin removing grass thatch in the spring, when it is excessively present in the lawn. Ideally, use it at least twice a year, in spring and in autumn, in an amount of 0.5 kg per 10 m2 . lawn watering after product application is imperative in order to achieve the appropriate action of the soil bacteria and the fertiliser. The product will not exert its effect if the lawn is dry. The Lawn thatch optimizer is suitable for all lawn types and wherever lawn is oppressed by last year’s dry grass (thatch). Caution: Do not combine this Lawn thatch optimizer with any other grass fertiliser, as the lawn may be over-fertilised. The lawn should be mowed 3 days after application of this product. gene), mycorrhizal fungi. Blood meal, meat meal, hair meal. The risk element content fulfills statutory limits.